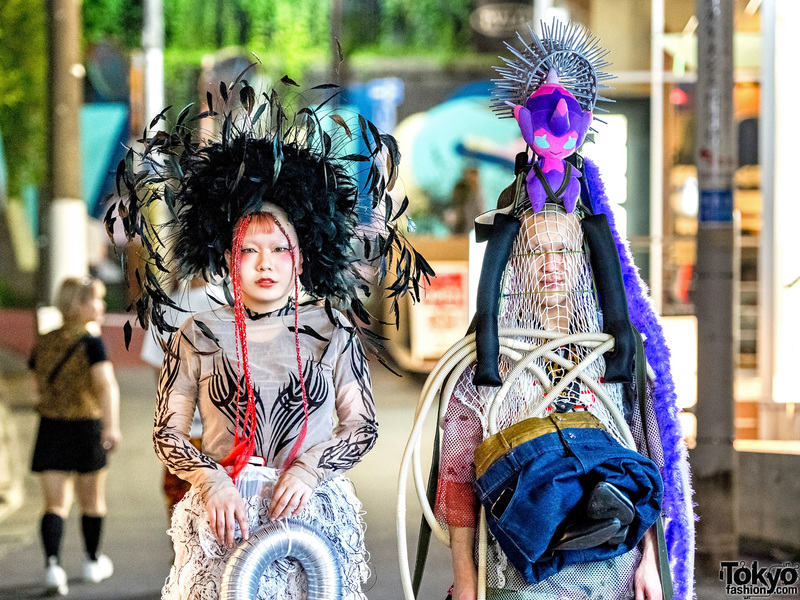 While out on an evening outing on the Harajuku street, we met Sakuran and Zun420, a duo who easily caught our attention with their striking avant-garde streetwear outfits. 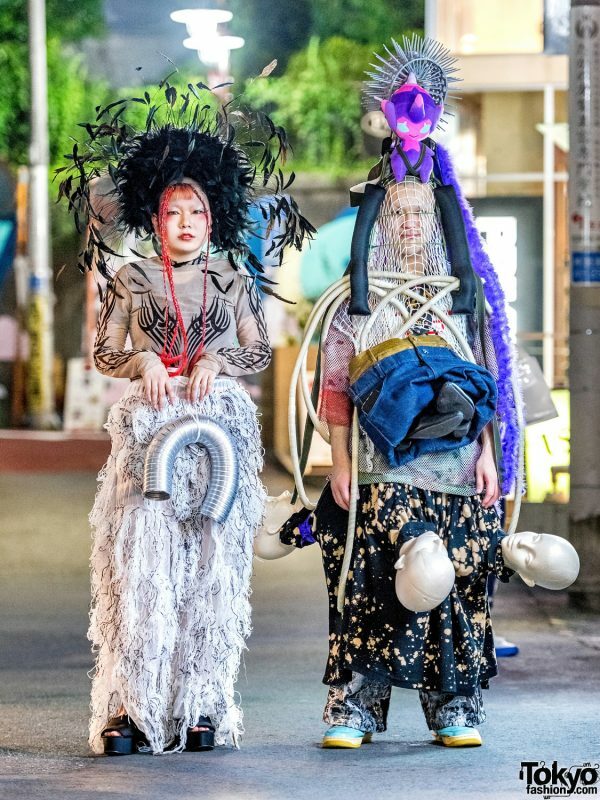 Let’s take a closer look at their individual ensembles. At the left is 18-year-old Sakuran, a student whose creative look consists of a sheer tattoo print top from Dolls Kill, a short-sleeve printed shirt underneath, remake drawstring pants with threaded furry detailing, and a pair of vintage black platform cross strap sandals. 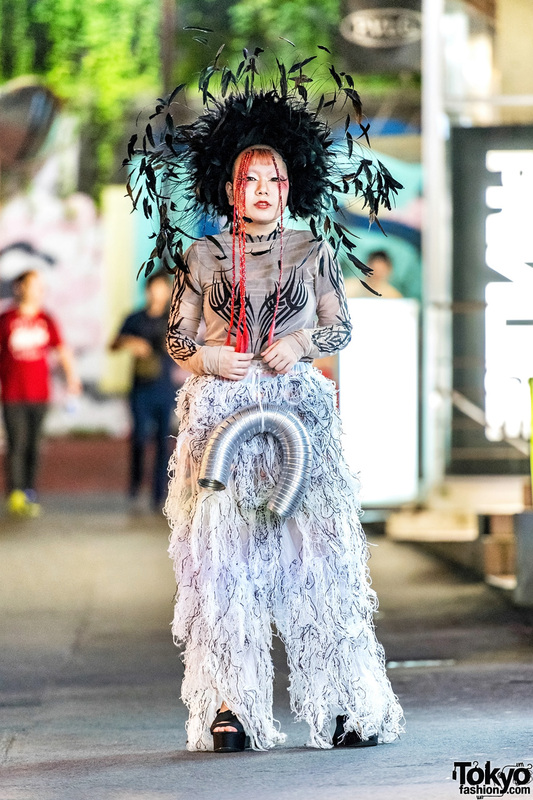 Partially shaved hair with braided hair falls on her short bangs, a black vintage feathered headdress, and a silver u-shaped ribbed tube hanging from her pants rounded out Sakuran’s avant-garde street style. 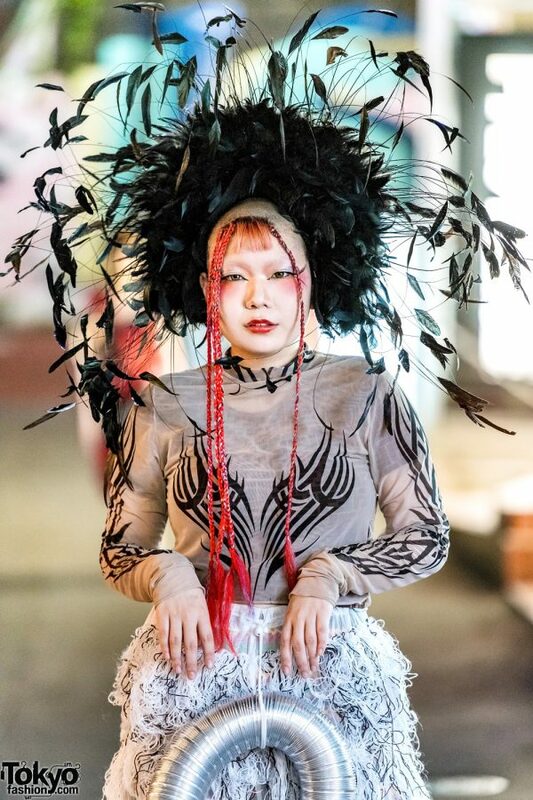 Sakuran mentioned that Dog Harajuku and Hoyajuku are two of her favorite fashion labels, and that she likes the music of 808. Follow Sakuran on Twitter and Instagram. See her full look in this Harajuku snap. 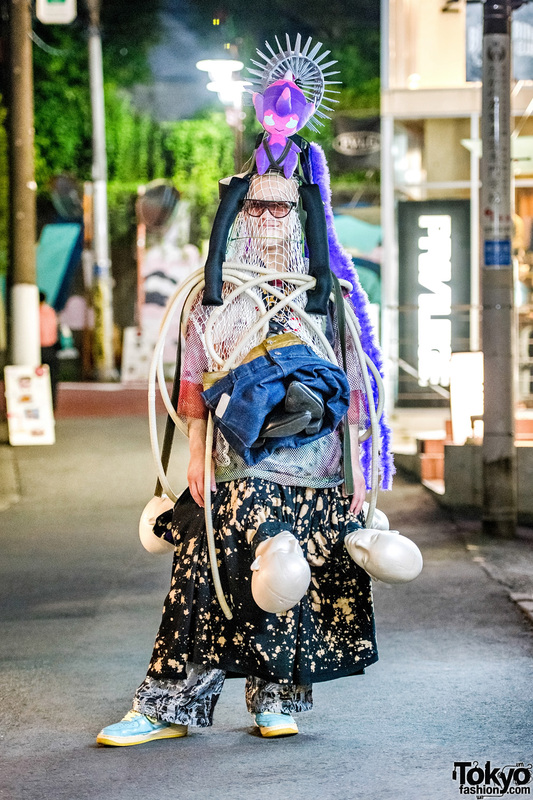 Meanwhile, Zun420 – a 20-year-old part-timer, is decked out in a layered mesh top from Cordyceps, which he wore over a printed handmade shirt, and paired with a paint-splattered print skirt with mannequin head embellishments from Mused. 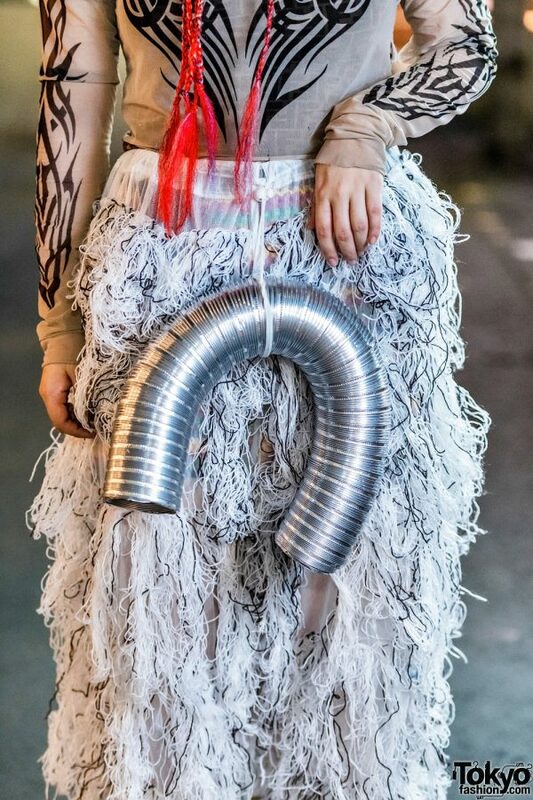 He styled his statement-making skirt with black-and-grey graphic print pants, slipped into blue-and-yellow colorblock sneakers, and is toting a handmade crossbody denim bag made up of layered pants and black pointy boots detailing. 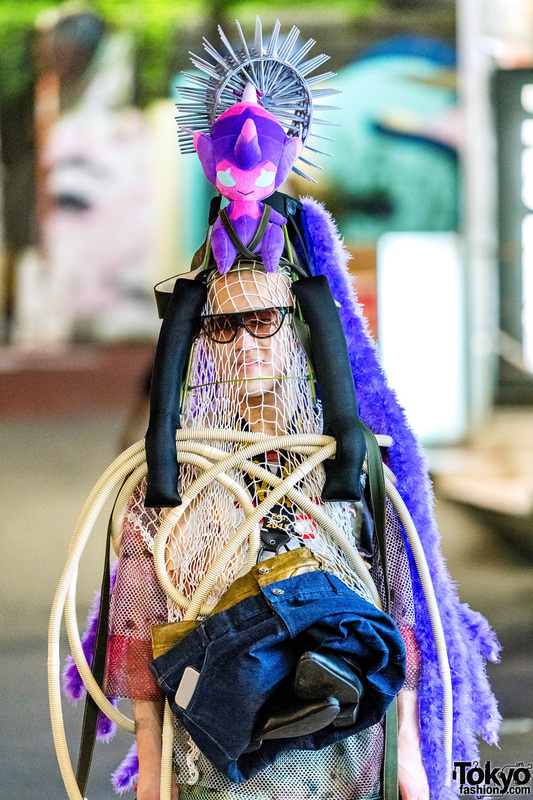 He accessorized his look with items such as a pair of sunglasses, a roped net veil, and a statement handmade headpiece made out of a Pokemon Poipole plush toy, silver spikes, purple boa hair falls, black tubing, leather straps and ribbed tubes. 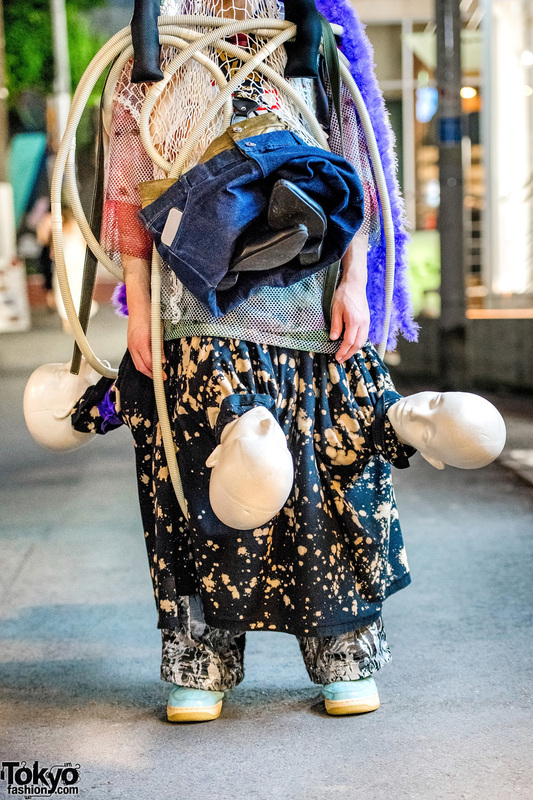 Zun’s favorite fashion brand is Radd Lounge, and he is also active on Instagram. 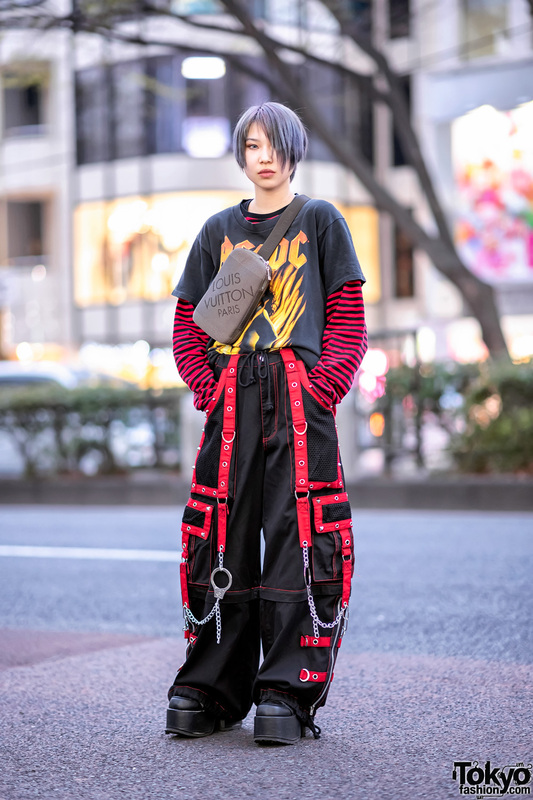 See his full look in this Harajuku street snap.